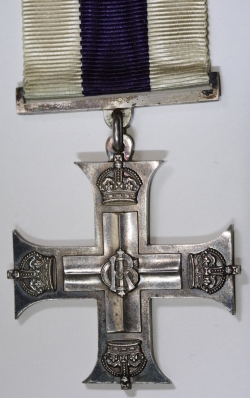 The Military Cross awarded to Lieutenant Herbert Lowe, The RCR and the 19th Cdn. Inf. Bn. Lieut. Lowe served in the ranks of The RCR from 1907 to 1912, when he transferred to the Signaling Staff in Halifax. He served overseas with the 19th Canadian Infantry Battalion and was Gazetted for the Military Cross on 1 Apr 1919. Herbert Lowe returned to serve briefly in The RCR as an officer for some months in 1919. Herbert's brother Walter was also a Royal Canadian. Sergeant Walter Lowe died on 30 Oct 1916 of wounds received in a grenade accident. He was a recipient of the Military Medal. It was the sort of thing you were told only once you were trusted. Trusted to believe a deep dark regimental secret. Trusted not to thing less of a man for hearing him tell the tale. And it was a story that for so many years could not readily be proven or dis-proven. Never giving the story much credence, it remained in the back on my mind as I started researching the Regiment's activities in First World War. Using the regimental history as my starting point, I searched the London Gazette for the citations of as many regimental awards of the Military Medal (MM), the Distinguished Conduct Medal (DCM) and the Military Cross (MC) that I could find. Combining the results of the MC searches with an examination of lists of regimental officers, I found a recurring theme. As I searched for each of the officers identified as recipients of the MC, the list grew shorter as I eliminated those whose regimental service occurred only before or after the War. Additionally, some regimental officers received the award while serving with other units. Lastly, some officers of the Canadian Army Medical Corps who received the MC were only attached to The RCR for a period during the War. These various circumstances winnowed an initial list of 38 names down to 29 regimental officers who received the MC while serving with the Regiment. These discrepancies gave me cause to revisit that old rumour of regimental "stinginess". Knowing that other resources are readily available today to research on honours and awards, I decided to see what could be done to confirm or deny this rumour. These represent the most numerous awards to the infantry battalions of the First World War, thus giving the best opportunity for finding comparable data from across the Canadian Corps. The Military Medal awarded to 261628 Private Arthur Frederick Littlewood, MM. Littlewood served at the front with The RCR from 21 Oct 1916 until he was severely wounded at Cambrai on 29 Sep 1918. Pte Littlewood lost his left arm and his right arm was seized at the elbow as a result of his injuries. I knew that the major research reference on the Military Medal (Abbink, 1987) to the Canadian Expeditionary Force (CEF) wasn't going to help for two reasons. Firstly, it would require a line by line examination of the over 12,300 MMs awarded to Canadians. Secondly, many awards were Gazetted simply as "Can. Inf. ", each of which would then require separate research to try and confirm a battalion. Pursuing other available resources; the internet and other regimental researchers, I sought additional data on other CEF infantry battalions. Using online searches I was able to find some online CEF battalion histories with the desired data, and requests to two online forums provided much more. Within 24 hours I had MC-DCM-MM data for 26 of the infantry battalions of the First World War. Unfortunately a direct comparison of numbers would not be effective because of differing battlefield experiences, primarily time at the front. Once the data was tabled, it would have to be rationalized into some form that would allow a more direct comparison. I decided to convert all of the data into a format of average "medals/year." The first factor I needed to account for was the dates of authorization of the three medals. Two were authorized during the War, the MC on 31 Dec 1914 and the MM on 25 March 1916. While the date for the MC did not affect the unit statistics, that for the MM certainly did. Secondly, I considered how long each Division was in the field, for example the 1st Canadian Division arrived in France in February 1915, while the 3rd Division entered the lines in France in December 1915. Using these modifiers, I developed a spreadsheet that calculated, for each medal and battalion, average rates of "medals per year" based on the number of months each battalion was in operations. In order to maintain a controllable result, I worked with the basic assumption that time in and out of the front lines would be relatively balanced, and that the likelihood of events such as battles with high casualties among officers (i.e., those who would most likely write award recommendations) were equally shared between the units. Statistics were tabled and numbers crunched for the 25 battalions for which I had figures. I compared the medals/year data for each of the three awards separately, and as a total for each unit, seeking trends within Divisions that might show bias or an imbalance which might leading back to a grossly incorrect assumption about balanced battle experiences. As expected, those trends did not leap off the spreadsheet. For example, most 1st Division units (6 of 7) were near the top of the list in medals/year for the DCM, but most (5 of 7) were also at the bottom of the list for the MC, while they were spread from the #1 position to the #20 position for the MM. 3rd Division units were all in the bottom half of the MM list, but spread out on the DCM and MC lists. No strong trends appeared that held across the three medals, or across units of an entire Division. The RCR had a combined total for the three awards of not quite 67 medals per year (m/y). The only unit with a worse overall track record was the 24th Canadian Infantry Battalion (at 64 m/y), and the 2nd Battalion, Canadian Mounted Rifles ranked marginally higher than The RCR. The median statistic for medals per year between the 25 units was 89. At the upper end of the range were the 10th Battalion (at 131 m/y) and the 85th battalion (at 128 m/y). The medals per year rate for The RCR was only 49% of the highest rate (the 10th Bn's), and 72% of the median figure. Was The RCR "stingy" in recommending honours and awards for its troops during the First World War? Possibly, but if they were, there were other units which were equally stingy while others were significantly more generous. Perhaps more importantly, we should be asking if there are discernible reasons why this had occurred. The large number of awards Gazetted after 1918 does raise some questions. Could this have simply been a backlog of awards to be approved and then published? Or was there a regimental basis for the paucity of awards early in the War and the later abundance? I considered that one possible explanation may lie in the changes of regimental appointments throughout the War. Did the Permanent Force NCOs and officers of the Regiment who filled the battalion chain of command at the start of the War expect a higher standard of performance; a regimental standard that fewer soldiers measured up to compared to other units' assessment of their own troops? This would fit with the Regiment's role as instructors and trainers striving to maintain the highest possible standards of performance. If this was so, perhaps the turnover of officers and senior NCOs and WOs, caused by transfers, injury and deaths, meant that most of the Regiment's officers and NCOs at the end of the War were not those of the Permanent Force that started the war with the Regiment. (For example, only one officer is identified in the regimental history as being on the Regiment's strength both on 26 August 1915 when the unit sailed from Halifax, and again in September 1918.) And did those replacement officers and NCOs employ an assessment standard more in line with other units? But confirmation of this theory would require similar data for at least one other unit of the CEF. While most of the data gathered was only the requested medal statistics for the various units, the CEF Battalion history of the 4th Canadian Infantry Battalion offered more. This unit's published history contains a complete list of award recipients, including citations and dates of Gazettes (and even identifying those who had received awards while serving in other units). This data, from a unit that had no Permanent Force officers or NCOs, and which was from a different Division, showed a very similar distribution of awards over time. Based on this, barring an unusual coincidence, there seems to be little significance to the distribution of awards which shows a large number of late awards to both The RCR and the 4th Battalion. While the average rates of awards recommended and received by the RCR for the First World War could potentially support the rumour of regimental "stinginess", our results so far are not completely conclusive. Since the origin of the rumour cannot be pin-pointed, it could well have started with the returning soldiers of the Great War. Such a rumour, taking on a life of its own, could have survived well beyond any reasonable period of applicability. To examine this rumour further it would be necessary to see what statistics could be found for later conflicts, particularly the Second World War and the Korea War. Conveniently, awards for these later conflicts have been compiled into a handy reference by Commander John Blatherwick in his volume "Canadian Army; Honours—Decorations—Medals; 1902-1968" which was first published in 1993. I reviewed the lists in Blatherwick for the Military Medal for the First Canadian Division in the Italian campaign of the Second World War, and those for the nine infantry battalions which fought in the Korea War. The results follow. It becomes clear from these statistics that, even if a rumour of regimental stinginess in honours and awards was justifiable after the First World War, it was certainly not maintained in Sicily and Italy or in Korea. It is possible that the lingering rumour of the Regiment's parsimonious approach to honours and awards finds substance in the distribution of peace time awards since 1953, but that data is not readily available in a suitable format to continue this examination. The Star of Military Valour. There is, however, one other perspective that may have a bearing on this topic. It is possible that a continued, and possibly increasingly unfounded, sense of a miserly regimental practice in recommending honors and awards lies not in the actual practice, but in that much vaunted attribute of "quiet professionalism." The regimental expectation that soldiers, NCOs and officers of the Regiment practice the role of the quiet professional is certainly laudable. But has an error been committed in having this attribute migrate from being an individual characteristic to being a regimental one. While we may feel that Sergeant Bloggins should not beat his/her own drum over honours received, there is certainly nothing wrong with the Regiment doing so and broadly proclaiming his/her achievements. Note that in this context, the use of the term "Regiment" is not confined solely to actions taken by Regimental Headquarters. It should be taken to include "Regiment" in its broadest sense, including "Battalion", "Company, "Platoon", "Association", and every member of the regimental chain of command who finds the opportunity to promote the achievements of these Royal Canadians. Such an initiative, however, starts with the open sharing of details of awards and recipients. The lingering rumour of a paucity of awards within the Regiment may well be less a factual reality and more an internal, and external, public relations deficiency. Members of The RCR have been receiving awards, but has the Regiment been doing its share to ensure that these Royal Canadians are known and recognized for their achievements? Major Charles Beresford Topp of the 42nd Canadian Infantry Battalion was making a reconnaissance of the line on the early morning of the 28 September. As he arrived at the headquarters of The RCR, a shell struck the HQ dugout, seriously wounding the Commanding Officer and killing the Adjutant. As all twelve company officers in the lines were Lieutenants and already engaged in the operation at hand, Major Topp was ordered to take command of the Battalion and did so until early morning on the 29th when he rejoined his own Battalion to guide it forward. Maj Topp was wounded on the 29th and was evacuated from the field. A letter he wrote in 1936 to the Historical Section of the Department of National Defence, which can be found in The RCR war diary, notes that as he lay in his hospital bed some days later, he wrote the recommendation for the Victoria Cross awarded to Lieutenant Milton F. Gregg, the only member of the Regiment to be so honoured during the Great War. SUPPLEMENT TO THE LONDON GAZETTE, 4 OCTOBER, 1919; BAR TO THE MILITARY CROSS - Capt. (A./Maj.) (now Maj.) Charles Beresford Topp, D.S.O., M.C., 42nd Inf. Bn., Quebec R. - For conspicuous gallantry and devotion to duty north of Cambrai, 26th-30th September, 1918. He took command of the situation on the R. Can. R. frontage, and, under heavy fire, made a complete reconnaissance of the front, reorganizing the disposition of the companies and establishing a line of defence until the situation was completely clear and well in hand. (M.C. gazetted 3rd June, 1918).